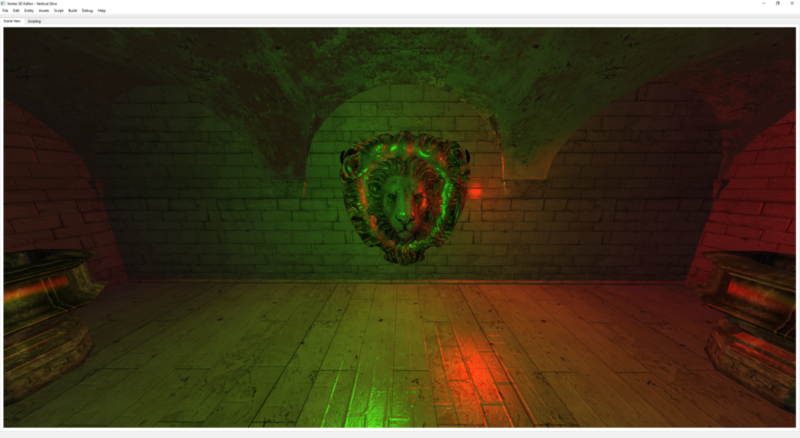 Normal mapping in the new Deferred Renderer. Here, I switch back and forth between the regular Geometry Pass shader and a Normal Mapping-aware shader. Notice how Normal mapping dramatically changes the appearance of the bricks, making them feel less part of a flat surface and more like a real, coarse surface. I initially discussed Normal Mapping back in 2014, so I definitely recommend you check out that post for more details on how the technique works. The biggest difference in building Normal Mapping in Vortex V3 compared to Vortex 2.0 was implementing it on top of the new Deferred Renderer. There is more work to be done in terms of Normal Mapping, such as adding specular mapping, but I’m happy with the results so far. Next week we continue working on graphics! Stay tuned for more! Vortex loading and running an external script that changes the texture of an entity’s material. In the image above, I’ve created two boxes. Both of these have different materials and each material references a different texture. What you can see I’m doing is that I “mistakenly” drag from the Asset Library a character texture and assign it as the second box’s texture. Oh no! How can we fix this? 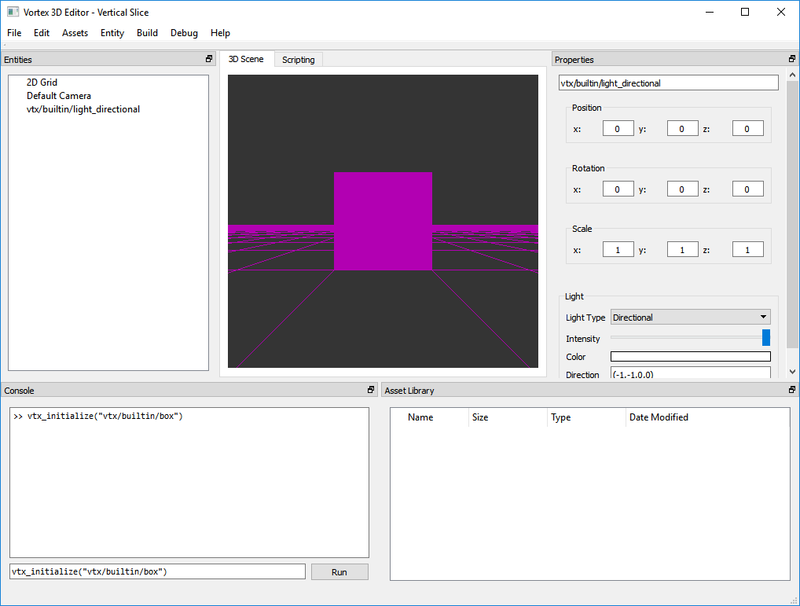 It’s easy: just run an external script that will assign the first box’s texture to the second! As you can see, the script is pretty straightforward. It finds the boxes, drills all the way down to their materials and then assigns the texture of the first box to the second. The changes are immediately seen in the 3D world. It’s worth noting that all function calls into the vtx namespace and derived objects are actually jumping into C++. 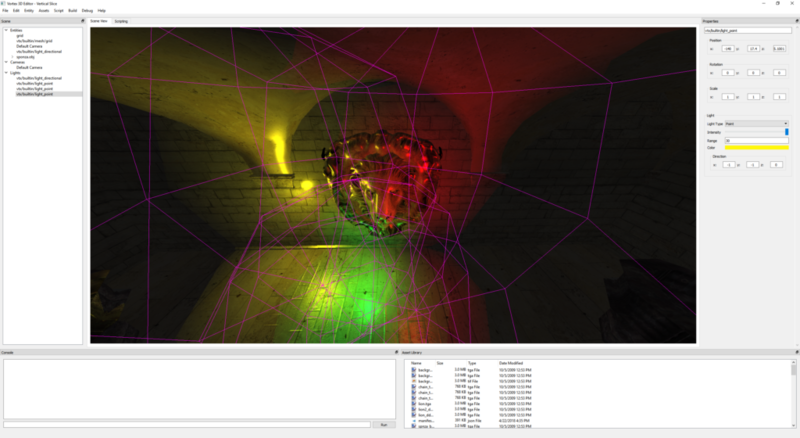 This script is therefore dynamically manipulating engine objects, that’s why we see its effects in the scene view. The function names are still work in progress, and admittedly, I need to write more scripts to see if these feel comfortable or if they’re too long and therefore hard to remember. My idea is to make the scripting interface as simple to use as possible, so please if you have any suggestions I would love to hear your feedback! Feel free to leave a comment below! Next week I will continue working on adding more functionality to the scripting API, as well as adding more features to the renderer! Stay tuned for more! This week, work on the scripting interface continued. As the image below shows, I can now access an entity’s components and even drill down to its Material through the Lua console. 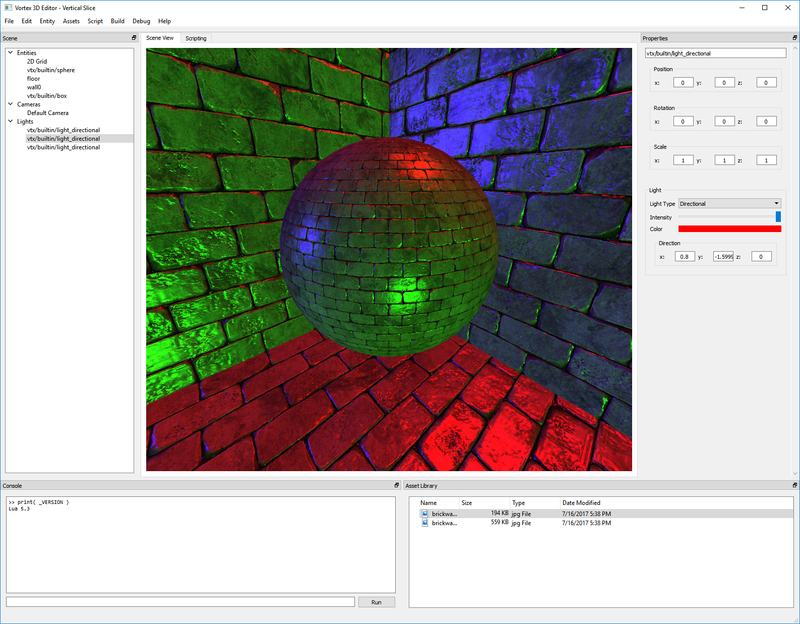 Introspecting a Render Component to access its material via the Lua interface. The image above shows an example of the scripting interface for entities and components. Here, we are creating a new Entity from the builtin Box primitive and then finding its first component of type “1”. Type 1 is an alias to the Render Component of the Entity. It is responsible for binding a Mesh and a Material together. 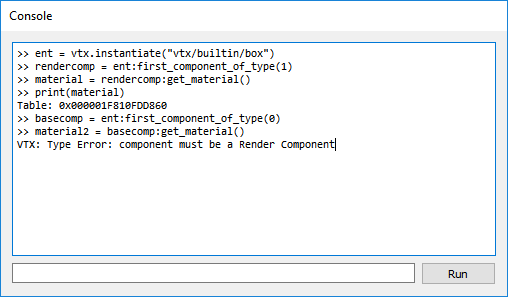 Once we have the Render Component, we use it to access its Material property and print its memory address. For the interface, I’ve decided that all components will be hidden behind the vtx.Component “class”. Now, this class will be responsible to exposing the interface to all native component methods, such as get_material(), set_mesh(), get_transform() and so forth. In the Python way, we will perform a sanity check before actually invoking the function on the component, and actually halt the operation when an error is found. You can see that in the example above. Here we’re purposefully attempting to get the material of a Base Component (component type 0), which doesn’t have one. In this case, the Engine detects the inconsistency and raises an error. I feel the Python way is the way to go to prevent subtle hard-to-debug errors arising from allowing any method to be called on any component and happily carrying on through to -hopefully- reach some sort of result. A third alternative would have been to actually expose a separate “class” for every component type. This would certainly work, but I’m concerned about a potential “class explosion”, as we continue to add more and more components to the Engine. Furthermore, I feel strongly typed duck typing is a good approach, well in tune with the language philosophy, for a language like Lua. Now that we can drill all the way down to an Entity’s material, it’s time to expand the interface to allow setting the shader and the material properties, allowing the script developer to control how entities are rendered by the Engine. Stay tuned for more! Vortex Editor turns 1 year! I hadn’t realized, but the Vortex Editor turned one year old a couple of months ago. I set off to work on this project in my free time with a clear set of objectives and it’s hard to believe that one year has already passed since the initial kick-off. Of course, the Editor is closely tied to the Engine, which has seen its fair share of improvements through this year. 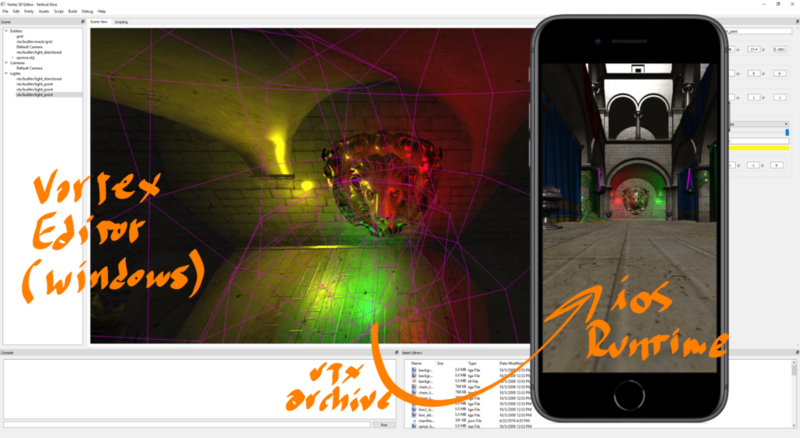 From building an entirely new deferred renderer to completely replacing the node-based scene graph system to an Entity Component System model that is flexible and extensible, enhancements have been wide and deep. This post is a short retrospective on the accomplishments of the Vortex Editor and Vortex Engine through this last year. Kicked off the third iteration of the Vortex Engine, codename “V3”. Upgraded the Graphics API to Core OpenGL 3.3 on Desktop and OpenGL ES 3.0 on Mobile. Implemented Deferred Rendering from scratch using MRT. Establish the base for PBR rendering. 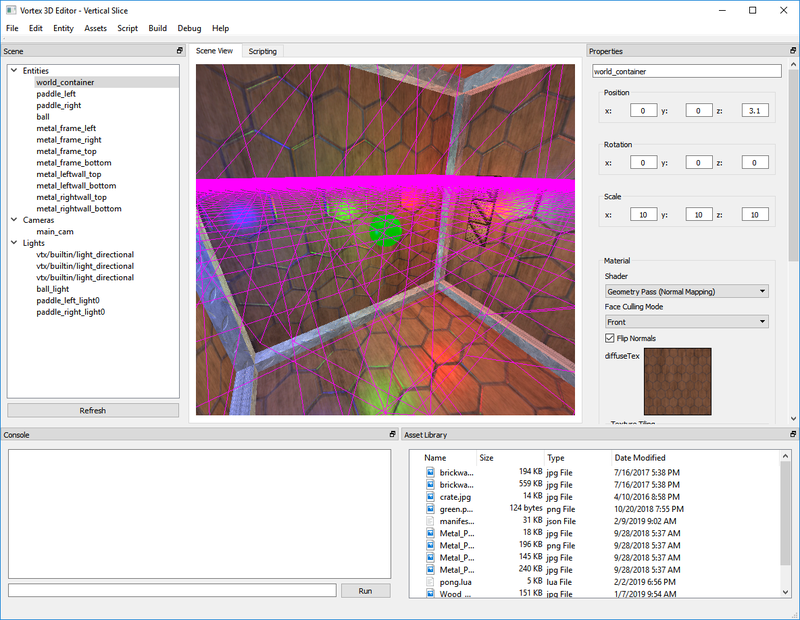 Overhaul of several internal engine facilities, such as the Material and Texture systems. 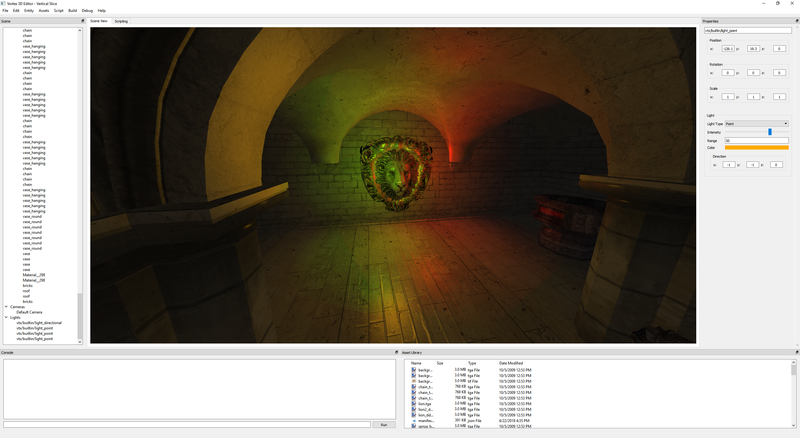 Completely redesigned engine facilities such as Lights and Postprocessing. GCC and MSVC and runs on Linux, Mac, Windows, iOS and Android. Started moving codebase to Modern C++ (C++11). Successfully kicked off the project. Built from scratch in C++. Built a comprehensive, modular UI with a context-sensitive architecture that adjusts what you’re doing. 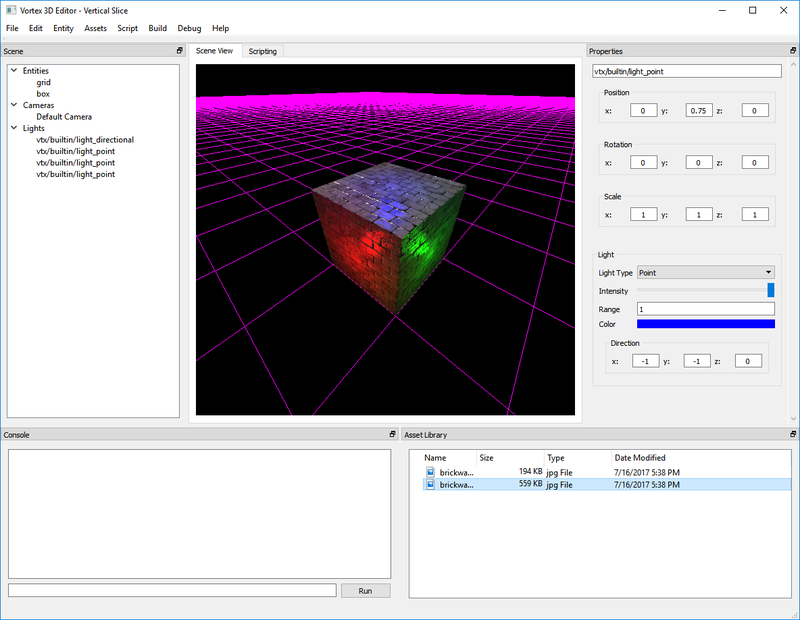 Bootstrapped the project using Vortex Engine 2.0, then quickly moved to V3 once things were stable. Provide basic serialization/deserialization support for saving and loading projects. Implemented a Lua REPL that allows talking to the engine directly and script the Editor. Friendly Drag-and-Drop interface for instantiating new Entities. Complete visual control over an Entity’s position, orientation and scale in the world, as well as the configuration of its components. Allow dynamically adding new components to entities to change their behavior. It has been quite a ride for the last year. I believe all these changes have successfully built and expanded upon the 5 years of work on Vortex 1.1 and 2.0. I’m excited about continuing to work on these projects to ultimately come up with a product that is fun to tinker with. My objectives for this year two of the Editor include: implement scene and asset packaging, expanded scripting support and PBR rendering. Last week when we left off, we were able to implement a Lua REPL in the Vortex Editor console. This week, I wanted to take things further by allowing Lua scripts to access the engine’s state, create new entities and modify their properties. Scripting Interface to the Engine. A C++ cube entity is instantiated from Lua code that is evaluated on the fly in the console. In order to get started, I added a simple single function: vtx_instantiate(). This function is available to Lua, but its actual implementation is provided in native code, in C++. The image above shows how we can use this function to add an entity to the scene from the console. This simple example allows us to test two important concepts: first, that we can effectively call into C++ from Lua. Second, it shows that we are able to pass in parameters between the two languages. In this case, the single argument expected is a string that specifies which primitive or asset to instantiate. With this in place, we can now move on to building a more intricate API that enables controlling any aspect of the scene, respond to user input and even implementing an elaborate world simulation. Best of all, because the Lua VM is embedded into the engine, scripts built against the Vortex API will by definition be portable and run on any platform the engine runs on. This includes, of course, mobile devices. The idea now is to continue to expand the engine API, developing a rich, easy to use set of functions. API design should prove an interesting exercise. Stay tuned for more!